Betty Jean Williamson of Beacon Hill Music tells us that ROCKiT space will be open in January after all. The current lease runs through January 23, and the outlook for filling the labor and financial gap is positive, though continued support from the community will still be necessary if a new lease can be negotiated. Twenty-four folks came to the ROCKiT space community meeting on December 5. They voiced great support for keeping ROCKiT space open and developing more programs to make it more sustainable. Part of the plan is to raise $2000 by January 1, for a rainy day fund equal to one month’s expenses. This will be used to cover the projected $100-200 monthly deficit until new income streams can come on line. 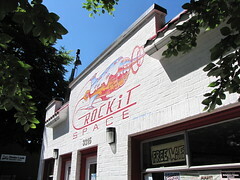 Donations can be made at www.rockitspace.org—look for the paypal button on the home page. ROCKiT space is open Monday, Wednesday, and Friday 11:00 am-6:00 pm and Saturday 3:00-6:00 pm. Volunteers are staffing these hours; you can sign up to help during business hours or contact Betty Jean Williamson at bjwlmp@msn.com or 206-658-0187. Beacon Hill Music is starting a casual and quite affordable songwriters’ group where people come together and play songs for each other. Sundays at 4:00 pm at ROCKiT Space, starting this Sunday, December 12. $5 per session to cover costs. Contact Paul Ray through email at beaconrocks@gmail.com or 206-658-3622 or show up at ROCKiT Space on Sunday. Tuesday, December 14, 7:00pm. Reconvene the group that met last week. Updates on fund raising, events and community networking. Performers come from all over Seattle and even from parts unknown to share a diverse range of music, and audience members join in whenever the mood strikes. Any given session can feature artists of all ages and from all walks of life, making each Open Mic night a completely unique experience. Saturday, December 18, 7:00-10:00 pm. $5 minimum donation at the door. December 28. 7:00pm house party music event features two old time/country bands: Red Dog, a popular trio, and Dram County, a brother sister duo and guests. Minimum donation $7 at the door, $5 in advance, available at Rockit Space starting Monday 12/13 during business hours. Suzanne Sumi continues this music happening for the little ones every Wednesday morning 9:00-10:00 am at ROCKiT space.